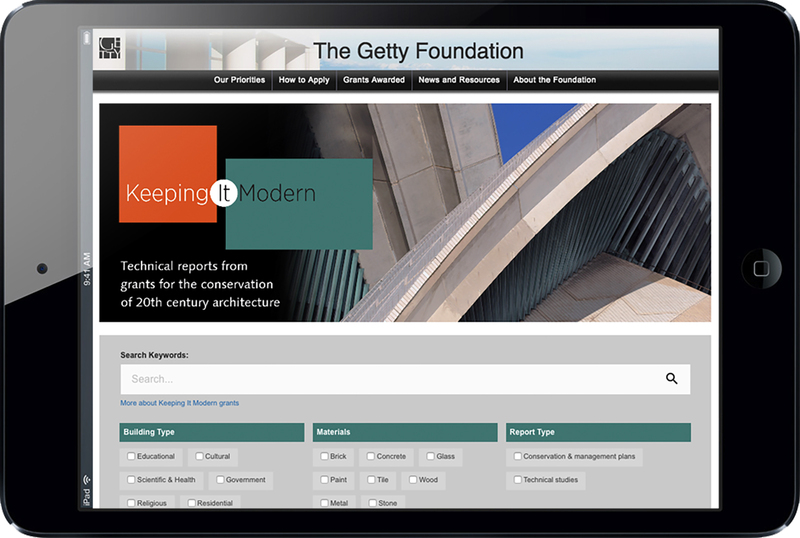 Established in 2014, Keeping it Modern is an initiative of the Getty Foundation that supports the conservation of twentieth-century architecture around the world. Experimentation with materials and construction techniques during this era resulted in great architectural innovation, but they were often untested and have presented complex conservation challenges with age. In the initiative’s first 4 years, more than 40 grants have been awarded to model projects that focus on the comprehensive planning, testing, and analysis of modern materials, as well as the creation of conservation management plans that guide long-term maintenance and conservation policies. The projects chosen represent a variety of shared concerns that practitioners in the field face when preserving modern buildings, from the aging of materials such as concrete and glass, to scientific analyses of exterior and interior finishes. Unity Temple by architect Frank Lloyd Wright. Completed 1908. Oak Park, Illinois. 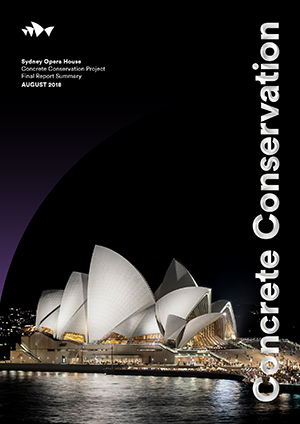 Cover of the Sydney Opera House report. Einstein Tower by architect Erich Mendelsohn. 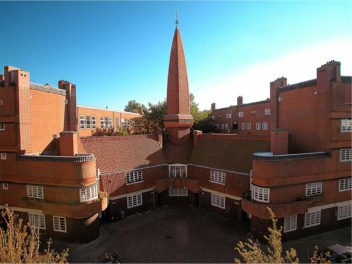 Completed 1921. Potsdam, Germany. Miami Marine Stadium by architect Hilario Candela. Completed 1963. Miami, Florida. 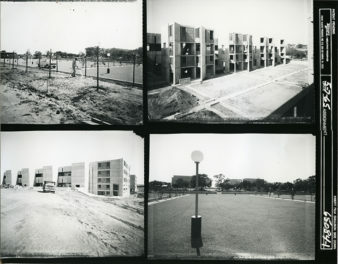 “Collegi” buildings by architect Giancarlo De Carlo. Completed 1966. Urbino, Italy. How can these individual projects have an impact beyond their chosen site? 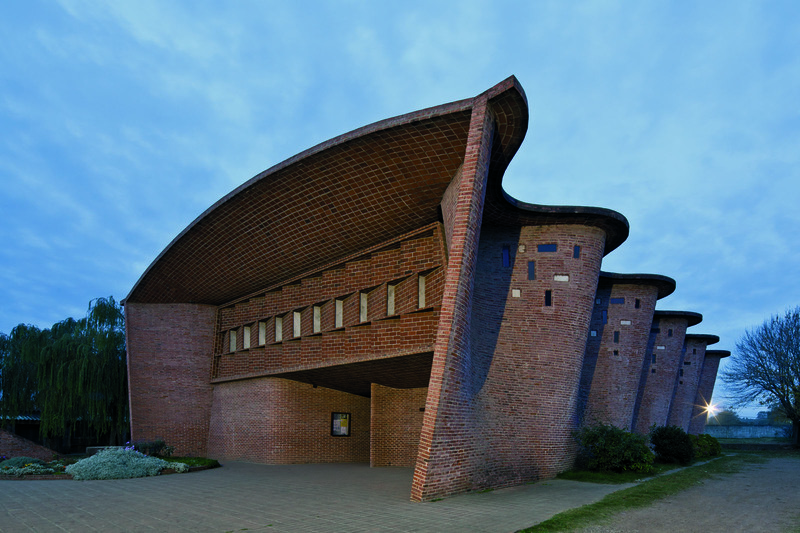 One example is Eladio Dieste’s Cristo Obrero Church in Atlántida, Uruguay. 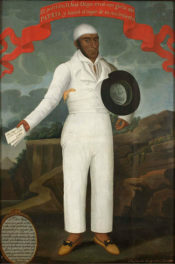 Dieste was a prolific Uruguayan architect, who designed over 200 structures in Latin America and Spain. Noted for his use of brick to create undulating walls and thin-shelled vaults, Dieste developed unique structural engineering solutions to execute his distinctive designs. By identifying the as-built structure of the Cristo Obrero church with 3-D imaging, the Keeping It Modern project team was able to identify where the actual construction diverged from the plans and add this information to a comprehensive conservation management plan. As a result of the research, the caretakers of the Cristo Obrero church will have a greater understanding of this site. And on a larger scale, the results can be applied towards the care of other Dieste buildings with similar materials and features. Additional reports will be added as they are completed, and the newest round of Keeping It Modern grants will be announced in the fall of 2018. As with any project of this scale, there are a host of collaborators. The Foundation would like to thank all of its Keeping It Modern grantees for their generosity in preparing these reports for public dissemination. They also appreciate the assistance of a number of colleagues across the Getty who helped design, build, and test the Report Library—including colleagues from the Getty Digital team as well as the Getty Conservation Institute, Getty Research Institute, Getty Publications, and Trust Legal. Finally, program associate Cynthia Querio was a tireless leader in seeing this project to completion, and the Foundation is grateful for her patience, hard work, and skill in making this resource available to the field.